Schwarzenegger says gifts won't sway his actions. Criticized by challengers, gubernatorial candidate Arnold Schwarzenegger on Tuesday tried to reconcile campaign cash he's taken from donors with business before state government with an earlier pledge to wipe out special interest politics in California. Speaking on the "Eric Hogue Show" on radio station KTKZ (1380 AM) in Sacramento, the Republican movie actor drew a distinction between contributions from organized labor and Indian gambling tribes — traditionally Democratic givers he called "real big, powerful special interests" — and corporate donors. "Any of those kinds of real big, powerful special interests, if you take money from them, you owe them something," he said. Any corporate money he takes is irrelevant, Schwarzenegger said, because he wouldn't be influenced by it. "There are maybe corporations and companies that maybe the press identifies and says, 'Well that is a big company, they want certain things,' " he said, adding, "I don't promise anyone anything. There's no strings attached to anything." 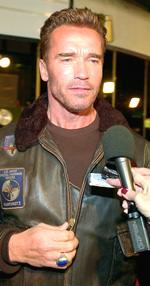 Larry Noble, executive director of the Washington-based Center for Responsive Politics, said Schwarzenegger was painting himself into a corner. "What he's doing is defining a special interest as 'somebody who supports my opponent,' " Noble said. "Corporations are also concerned about actions by the state, environmental regulation, safety regulations, taxes. He's saying that he, unlike anybody else, just will not be influenced by it," Noble said. "But they're all contributing because they want something — usually access, a favorable ear." Representatives of three of Schwarzenegger's competitors in the crowded Oct. 7 recall election against Gov. Gray Davis — Democratic Lt. Gov. Cruz Bustamante, Republican state Sen. Tom McClintock and independent Arianna Huffington — all criticized him as a hypocrite. "If it's an issue you agree with, there's nothing wrong with accepting their money," said Bustamante consultant Richie Ross. "But don't pretend that's not what you're doing." Schwarzenegger's remarks came three weeks after he announced his candidacy for governor by blaming special interests for corrupting politics and said he would "clean house. ... I don't need to take money from anyone. I have plenty of money myself." Campaign finance reports show Schwarzenegger has put $2 million of his own money toward his bid but also accepted more than $1 million from other donors. Many are pushing ideological causes or are affiliated with companies that have lobbied the Governor's Office, the Legislature and regulators on various matters affecting their bottom lines. 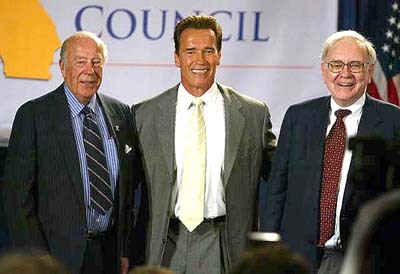 * Irvine Co. Chairman Donald Bren and his wife each gave $21,200 to Schwarzenegger's campaign, the maximum allowed under new campaign finance laws. The Southern California development company has spent more than $876,000 since 2001 lobbying on regulatory issues including water, endangered species, transportation and bond money for land purchases. Bren — a key supporter of Schwarzenegger's campaign co-chairman, former Gov. Pete Wilson — could not be reached for comment. Spokeswoman Jennifer Hieger said the donation was "a personal contribution, not a corporate contribution, so we can't speak for him." She described Bren as a friend of the actor. * Another developer, Castle & Cooke Inc., controlled by Republican donor David Murdock, gave $20,000. This year, records show the company was watching legislation that could limit corporations' ability to reduce tax liabilities by describing themselves as small businesses. Neither Murdock nor a representative was available for comment. * The Hilmar Cheese Co. in the Central Valley gave Schwarzenegger the maximum. Lobbying records show the company has spent more than $225,000 on lobbying since 2001 and this year tracked a bill to restrict expansion of large dairy farms and another affecting milk pricing. The company did not return calls for comment. * Paul Folino, chairman of the Costa Mesa-based technology company Emulex Corp., gave nearly $100,000 to a separate pro-recall committee controlled by Schwarzenegger. At least one other Emulex executive has contributed to the actor's campaign. Emulex lobbied state government during the 2001-02 legislative session on corporate tax legislation, records show. Folino said he was not familiar with that effort and that his support for the candidate is personal. Without mentioning Davis, Schwarzenegger said voters need to "get rid of an administration that is in the pockets of all the special interests." Schwarzenegger criticized Davis, Bustamante and McClintock for meeting with American Indian gaming leaders. "You cannot go to the Indians and talk about gaming and do them favors and promise them things and take contributions," he said. "How can you then as governor sit down with them and negotiate? It's over." Schwarzenegger said he takes money from individuals and businesses, which he does not consider special interests. Asked why Indian gaming tribes and labor unions are considered special interests and businesses are not, Schwarzenegger said: "Because they are the powerful interests. They are the ones that control things." [Richard Milanovich, chairman of the Agua Caliente Band of Cahuilla Indians] and other California tribal leaders were displeased with Schwarzenegger recently when he publicly described the tribes as special-interest groups and said he would not take any money from them. The actor also angered tribes when he turned down an invitation to speak to the California Nations Indian Gaming Association last week. "To be grouped into a category of a special interest is demeaning and derogatory to tribes as a whole," Milanovich said. "We are a bona fide government." Schwarzenegger said Thursday that describing tribes as special interests may not have been the best choice of words, but he stood by his decision. He does not want to accept money from any groups, such as labor unions or Indian tribes, that he will have to negotiate agreements with, Schwarzenegger said. — Aug. 6, news conference after his announcement on 'The Tonight Show' that he would enter the recall race. — Aug. 20, statement after meeting with his Economic Recovery Council. — Aug. 27, statement on Sean Hannity talk radio program. — Sept. 1, Labor Day appearance in Sacramento. — Sept. 4, announcing the return of a $2,500 donation from the Assn. for Los Angeles Deputy Sheriffs. — Sept. 4, interview with The Times.